BOSTON, February 2, 2016 – Lenders filed 1,224 foreclosure petitions to the Massachusetts Land Court in December, a 118.2 percent increase from the 561 petitions filed in December 2014, according to a new report from The Warren Group, publisher of Banker & Tradesman. 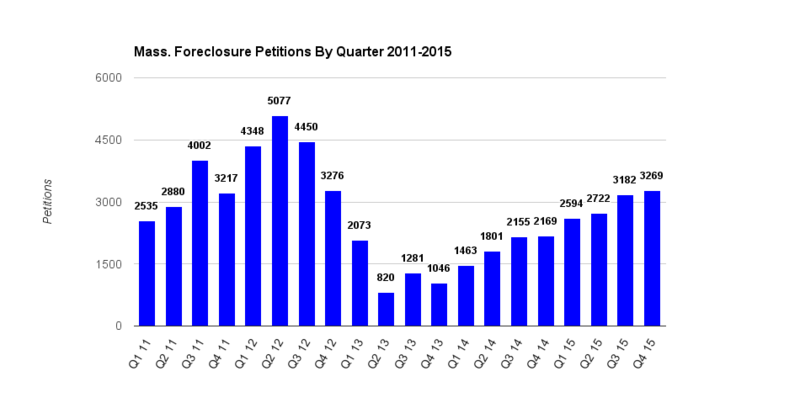 December was the 22nd consecutive month of double-digit year-over-year increases, but the 1,224 petitions still fall far short of the numbers Massachusetts saw during the foreclosure crisis last decade. For example, there were 2,724 foreclosure petitions filed in December 2007. Overall in 2015 there were 11,767 petitions filed, a 55.1% increase from the 7,588 filed in 2014. Petitions are the first entry in the public record in the foreclosure process, when lenders file a notice of intention to foreclose with the Land Court. There were 563 auction notices filed in December, an 11.7 percent increase from the 504 filed in December 2014. 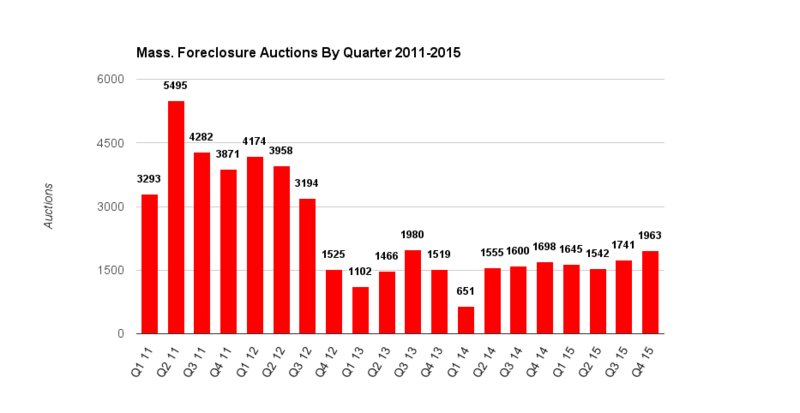 There were 6,891 foreclosure auction notices in 2015, a 25.2 percent increase from the 5,504 in 2014. An auction notice is an alert to the Land Court that the lender has scheduled an auction and publicly announced the time, date and address in legal notices in local newspapers. 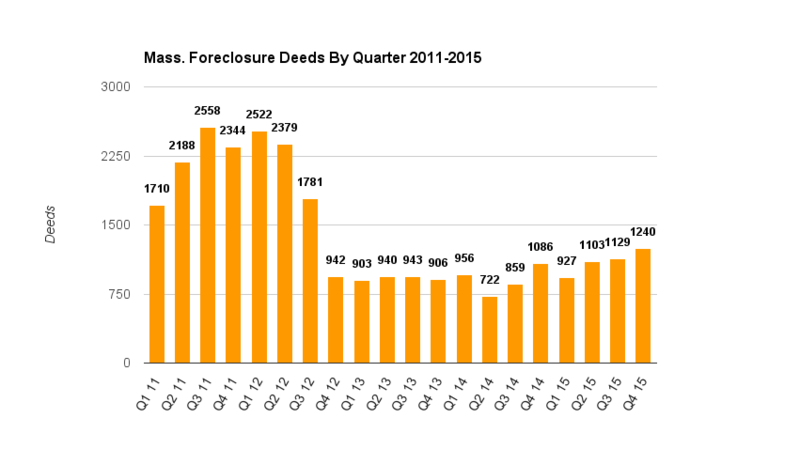 There were 469 foreclosure deeds filed in December 2015, a 46.1 percent increase from the 321 deeds filed in December 2014. There were 4,399 deeds field in 2015 overall, a 21.4 percent increase from the 3,623 field in 2014. These deeds represent completed foreclosures, when lenders record a new at the Registry of Deeds indicating there has been a change in the ownership of the foreclosed property. The most up-to-date petition filings, auctions and completed foreclosures are available weekly in Banker & Tradesman. The Warren Group has recorded and tracked real estate transactions since 1872. The fourth-generation family-owned company uses its long-time leadership in Boston real estate and banking information to produce specialized reports and news publications, including Banker & Tradesman and The Commercial Record. With more than 140 years as a local business leader, The Warren Group has developed relationships with a variety of industry leaders and trade groups, including bankers, mortgage brokers, credit unions and lawyers. Working together with our partners, The Warren Group organizes trade shows and industry events. For more information about The Warren Group, visit www.thewarrengroup.com.